Middle-aged Helmer Van Wonderen lives with his elderly father on the family’s farm in a quiet, rural part of the Netherlands. Helmer’s twin brother, Henk, was killed when he was eighteen; the car he was traveling in, driven by his girlfriend, Riet, was involved in an accident. Henk had been working on the farm with their father while Helmer was studying literature at university in Amsterdam. After the accident their father did two things: he told Riet to leave and never come back to the farmstead, and he told Helmer that his studies in Amsterdam were over, he’d be working on the farm from now on. His father frequently silent and his mother a changed woman since her son’s death, Helmer found himself alone and isolated. A farmhand, Jaap, with whom Helmer had enjoyed a brief friendship, was soon deemed surplus to requirements and when Helmer’s mother died a few years later, Helmer was left alone with his father. When “The Twin” begins Helmer is in the process of moving his now elderly and quickly deteriorating father into an upstairs bedroom. One day a letter arrives; it’s from Riet who Helmer hasn’t seen in over thirty years. She wants to come to the house to see Helmer but she won’t do it while his father is still alive: his father is very much alive, of course, but curiosity gets the better of Helmer and so he makes arrangements to meet up with Riet. Before long Helmer learns that Riet wants a favour from him and it’s one that will not only change his too familiar way of life, but threatens to reveal the deception he has played in giving the impression his father is dead. Riet wants Helmer to employ her wayward teenage son, named Henk, as a farmhand; she believes it will do him good and improve his attitude. Reluctantly Helmer agrees and the novel that ensues follows the up and down relationship between the two men; but as Helmer appears to re-engage with the world, young Henk increasingly withdraws. 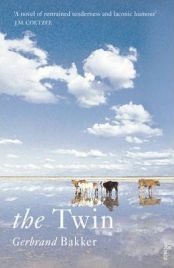 “The Twin” is written in such a way that it could only be of Northern Europe; the tone and pace are as flat as the Netherlands yet there’s something utterly compelling about this book. It has a constantly unsettling feeling created by the silence not only in the farmhouse but out in the fields too. The silence of Helmer’s dreary existence is broken by occasional visitors; the livestock dealer, the children that live in the nearest house, the man who comes to deliver Helmer’s new bed. What heightens the eerienes is that Helmer’s father is upstairs in bed yet he never makes a sound. Instead, his father listens to what is going on outside and downstairs. He knows exactly who has been to the house because he knows the routines and recognises the voices: the only thing he doesn’t understand is why none of the visitors come to see him. At first I found the relationship between Helmer and his father quite unsettling; at the outset it appears that it’s an abusive relationship in which Helmer does the very minimum for his father and it looks as if he may be trying to accelerate his father’s death. As Helmer’s character becomes more formed his actions aren’t explained, but actually become more ambiguous. The language is sparse and the pace slow with the back story unfolding very slowly. Perhaps in order to combat the feeling of endlessly repetitive and empty days, Helmer appears to make apparently trivial matters take on the utmost importance and this makes him a rather pedantic and frustrating narrator. However, as the story gradually unveils itself, Helmer becomes less of an irritation. Bakker twists the story into a complex (and sometimes unlikely) series of mirror images and coincidences but, happily, does not contrive an easy ending. Even an optimistic ending cannot cut through the overriding bleakness of the story but this sense of hopelessness and isolation is what makes the novel so compelling. An exquisite read. No Comments on "The Twin"